The Need For Precise Definitions In Climate Science – The Misuse Of The Terminology “Climate Change” | Climate Science: Roger Pielke Sr.
Today’s post is to further elaborate on the terms that are used. This new report from the National Research Council concludes that emissions of carbon dioxide from the burning of fossil fuels have ushered in a new epoch where human activities will largely determine the evolution of Earth’s climate. the natural causes of climate variations and changes are important, as are the human influences. The human climate forcings involve a diverse range of first-order climate forcings, including, but not limited to, the human input of carbon dioxide (CO2). Most, if not all, of these human influences on regional and global climate will continue to be of concern during the coming decades. 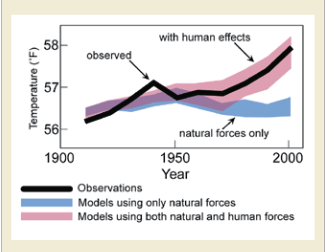 In addition to greenhouse gas emissions, other first-order human climate forcings are important to understanding the future behavior of Earth’s climate. These forcings are spatially heterogeneous and include the effect of aerosols on clouds and associated precipitation [e.g., Rosenfeld et al., 2008], the infl uence of aerosol deposition (e.g., black carbon (soot) [Flanner et al. 2007] and reactive nitrogen [Galloway et al., 2004]), and the role of changes in land use/land cover [e.g., Takata et al., 2009]. Among their effects is their role in altering atmospheric and ocean circulation features away from what they would be in the natural climate system [NRC, 2005]. As with CO2, the lengths of time that they affect the climate are estimated to be on multidecadal time scales and longer. The Earth’s climate system is highly nonlinear: inputs and outputs are not proportional, change is often episodic and abrupt, rather than slow and gradual, and multiple equilibria are the norm. Thus, the assumption of a stable climate system, in the absence of human intervention, is a mischaracterization of the behavior of the real climate system. 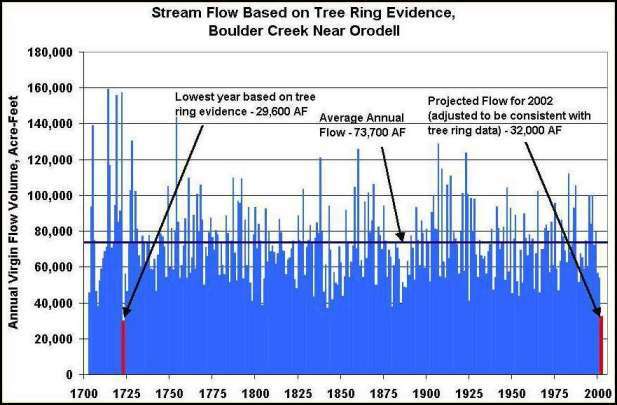 “Climate change’ is, and always has been occuring. Humans are now adding to the complexity of forcings and feedbacks, but change has always been a part of the climate system. Thus, rather than using terminolgy such as “climate change” [which has come to mean the human caused part mostly due to added greenhouse gases], I recommend just using the term “climate” or “climate system”. When change is discussed, the specific component that is being discussed should be presented, such as an increase in annual averaged surface air temperatures, a decrease in the length of growing season etc. Phrases such as “changes in regional and global climate statistics” could be used. There is a very important reason to scrap the use of “climate change” by the impacts community. Key societal and environental resources, such as water, food, energy, ecosystem function, and human health respond to climate not just to an incremental change in the climatic conditions. Another misused term is “global change“, when really what is almost always meant is a local and/or regional change in the environmental conditions, including from climate. The accurate terminology should be “environmental change“. Thus, my recommendations are to replace terminology such as climate change, climate stabilization, climate distruption and global change with accurate terminology. With respect to impacts on key resources, climate is one of the stressors, not just the “change” part. When changes in climatic conditions are discussed, present the actual climate variable(s) that are being altered. which will appear early in 2013. Our edits for the chapters have required us to address the improper use of the terminology by some of the authors. The current weblog post is intended to alert others to the frequent mischaracterization of the climate system.